Well you brightened my day with your layout. Sorry things are a little sour right now. hope it all works out for you. i really dohope that your next week will be all sunshine! IT's definitely been one of those weeks, i'm sorry yours has been that way too. Highlight of my week was finding my old journals from middle & High school. lots of laughs reading back in those. I think I'm gonna put some stuff up on my blog todday. sorry about your week~Love your Lo!!! great style!! Love your layout. The angle on the Magic Kingdom Castle is great! My son and his wife are trying to decide whether to buy a house or not. Tough decisions. Thanks for stopping by my blog and leaving a comment. Really like what I see here and just became a follower! Oh good grief, apparently I already was a follower! Please forgive my Senior Moment, all I can say is it's Friday afternoon and my brain is fried! Sorry your week is rough. Great layout! Your layout is awesome and I love your color choices. Sorry your week has been rough... I'm sending ya some good vibes. Love your layout and here's to hoping you have a better week next week. Here's to a better week! The highlight of my week was being approved for a new medication - now hoping it works! Love how you bordered the die cut! Great page! Next week is a new week, right?!! Here's hoping it's better all the way around. Sorry to hear it has been so rough this week. Hugs!!! I hope you have a wonderful weekend! Great layout - love the angle of that photo! Hope you have a happy weekend, despite the downer. hoping the weekend turns things around, keshet. love the page - that addon was perfect for your pics! Hope your weekend brings great family times...Hilight of my week was getting back on track with myself. 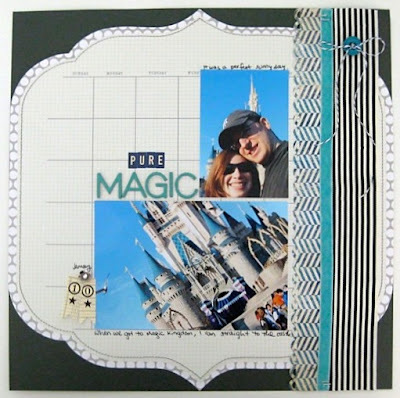 What fun pictures and they look so great with this paper! Love the staples and the little twine bow in the button! Hope you enjoy your weekend... the food sounds yummy! HUgs - hope next week is better for you!! I LOVE the design of this layout!! And the colors are just perfect! Sorry it was a tough week for you. Sending you big hugs sweetness. And eat a muffin for me - they sound totally yummy! Such a lovely page. Sorry about the house--D and I will probably have to wait a few more years to upsize, which means our boys will probably outgrow the house. I think it was Mother Teresa who said, "I know God won't give me anything I can't handle. I just wish he didn't trust me so much." Fun layout, i love that photo of you and your hubby. Love your layout! So totally cool...love the graphic appeal! Peanut butter chocolate chip muffins sound amazing. :) The layout is perfect in my opinion. I really love the colors and design - it all works so well together. Here's hoping you have a better week than last.